SPAIN’S STATE PROSECUTOR says it’s seeking charges of rebellion, sedition and embezzlement for members of the ousted Catalan Cabinet and the governing body of the regional parliament that allowed a vote to declare independence last week. The crimes can be punished, respectively, with up to 30, 15 and six years in prison under Spanish laws. The country’s chief prosecutor, Jose Manuel Maza, said he would ask the judges for preventive measures against the officials, but didn’t specify if those would include their immediate arrest and being sent to jail while awaiting trial. He said one lawsuit seeks charges for ousted Catalan officials in the country’s National Court. That includes regional leader Carles Puigdemont and his No. 2 official, Oriol Junqueras, although Maza didn’t name them. It is understood that Puigdemont has now traveled to Brussels. Belgian Asylum State Secretary Theo Francken said over the weekend that it would be “not unrealistic” for Puigdemont to request asylum. Maza said that a second lawsuit concerning members of the governing body of Catalonia’s parliament, including Speaker Carme Forcadell, was filed in the country’s Supreme Court. Some elected officials in Spain, including regional lawmakers, enjoy a degree of immunity before courts and can only be tried in the highest court. Maza spelled out the charges in a brief appearance before cameras in Madrid. He took no questions from reporters. Catalonia’s civil servants returned to work today for the first time since Spain’s central government rejected an independence declaration by imposing direct control, as Madrid warned that sacked regional leaders face criminal charges if they attempt to perform any official duties. Catalans watched and wondered whether the ousted leaders would defy their firing and face arrest, escalating a political crisis that already appears to have no easy way out. Speculation raged about the whereabouts of the dismissed Catalan President Carles Puigdemont and his deposed Cabinet, whose reaction will be key to whether Madrid’s takeover will be smooth or face opposition. As staff arrived at the headquarters of the Catalan government in Barcelona, Puigdemont posted a photo on Instagram of a courtyard at the building. Both the Catalan and Spanish national flags waved from the top of the building. The ambiguous Instagram post, accompanied by the words “Good morning” in Catalan and a smiley emoticon, left many guessing whether Puigdemont was inside the building. There was no indication of when the photo was taken. As dozens of journalists, curious onlookers and bemused tourists gathered in the square outside the Gothic government palace in central Barcelona, residents expressed confusion about who was actually in charge of Catalonia. “I don’t know — the Catalan government says they are in charge, but the Spanish government says they are,” said Cristina Guillen, an employee in a nearby bag shop. “So I have no idea, really. What I really think is that nobody is in charge right now. At least one portrait of Puigdemont was still hanging on a wall inside the Catalan government’s Generalitat building. Puigdemont is likely to be accused of rebellion today for pushing ahead with secession. Spain’s government has said the ousted leaders could be charged with usurping others’ functions if they attempt to carry on working. At least one member of the ousted government defied his dismissal by showing up at work and posting a photo on Twitter from his formal office. “In the office, exercising the responsibilities entrusted to us by the people of Catalonia,” said Josep Rull, who until last week was the region’s top official in charge of territorial affairs. Two police officers entered and left the building, followed minutes later by Rull, who told reporters and supporters that he would continue carrying out his agenda. But there were no official events listed on the regional government’s public agenda that is published online daily. Meanwhile, the two separatist parties in the former Catalan governing coalition held separate meetings to decide their next move. Interior Minister Juan Ignacio Zoido said that the government was giving the separatist politicians “a few hours” of time because the goal was “to recover normality in a discreet way and under the principle of minimal intervention” from central authorities. Catalonia’s regional parliament proclaimed independence from Spain in a secret ballot on Friday. The Spanish government dissolved the legislature, fired the government and regional police chief and called a new election for 21 December. The vote to secede came after a referendum on 1 October in favor of independence that was deemed illegal by Spain’s constitutional court. Puigdemont has vowed peaceful and “democratic opposition” to his Cabinet’s dismissal, but he hasn’t clarified if that means accepting an early regional election as a way out of the deadlock. A key factor will be how Catalonia’s estimated 200,000 public workers would react to their bosses’ dismissal, and whether any stay away from work in protest. 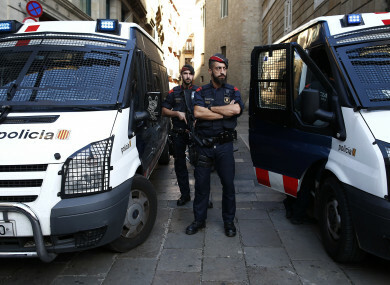 Secession moves by this wealthy northeastern region of 7.5 million have tipped Spain into its deepest crisis in decades. On Sunday, hundreds of thousands took part in an anti-independence demonstration in Barcelona, calling for Catalonia to remain in Spain and backing Rajoy’s use of unprecedented constitutional powers to seize wrest control from the pro-independence regional administration. “We won’t let Spain be torn apart into pieces,” read one banner. “The awakening of a silenced nation,” read another. “We have organised ourselves late, but we are here to show that there is a majority of Catalans that are no longer silent and that no longer want to be silenced,” said Alex Ramos, head of Catalan Civil Society, a pro-union grassroots group. The organisers said more than 1 million people turned out but police put the figure at 300,000. Many who oppose independence fear the political turmoil in Catalonia could have a severe economic impact, both in the region and on Spain itself. Some 1,700 companies have already relocated their headquarters to other parts of Spain in recent weeks amid the uncertainty. Spanish financial markets rose today after a poll suggested support for Catalan independence is waning, after falling amid Friday’s tumult. The Ibex 35 stock index was up 1.4% at 10,338 points, about as much as it had fallen on Friday. Spanish government bonds were also higher. The driver seems to have been a poll published by Spanish daily El Pais over the weekend that indicated more Catalans are against the declaration of independence than in favor. That suggests the independence movement might lose power when a new regional election is held. Email “Charges of rebellion, sedition and misuse of funds sought against ousted Catalan cabinet members”. Feedback on “Charges of rebellion, sedition and misuse of funds sought against ousted Catalan cabinet members”.